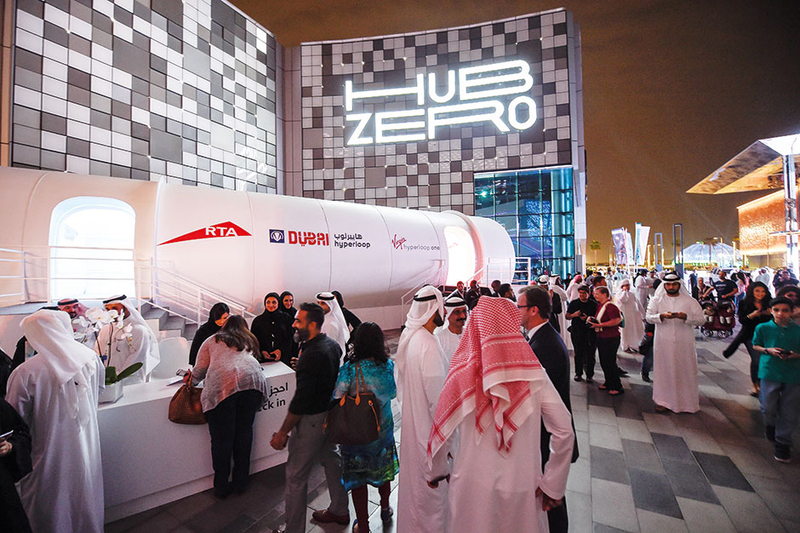 Dubai: Visitors to the UAE Innovation exhibit at City Walk 2 caught a unique glimpse of future transport with the public unveiling of the concept model of the Hyperloop commuter tube pod on Thursday night. Dubai is hosting the final week of UAE Innovation Month and the presentation by Roads and Transport Authority (RTA) as one of 90 displays touting all things tomorrow. Shaikh Hamdan Bin Mohammad Bin Rashid Al Maktoum, Dubai Crown Prince, inaugurated the UAE Innovation exhibit along with senior officials. 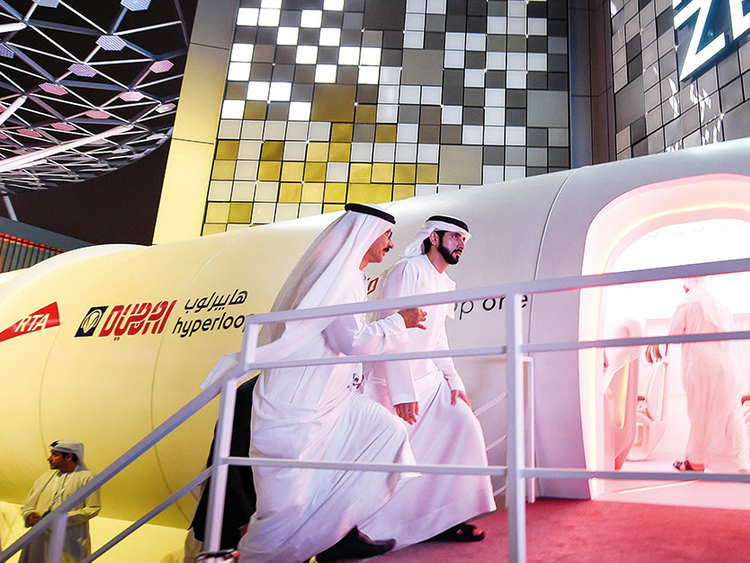 Mattar Al Tayer, chairman of the Board and director-general of RTA, toured along with Shaikh Hamdan inside the pod that will “take a shortcut into the future” along with other senior officials. The final week of the exhibition, which includes innovations by Dubai Police, Dubai Electricity and Water Authority, and other government entities is open to the public until Wednesday. As part of the RTA display, roads officials also exhibited several initiatives such as autonomous pods. The RTA has confirmed that the Hyperloop project has advanced to the stage where the agency is considering possible routes for the futuristic transportation mode across the emirate and beyond. 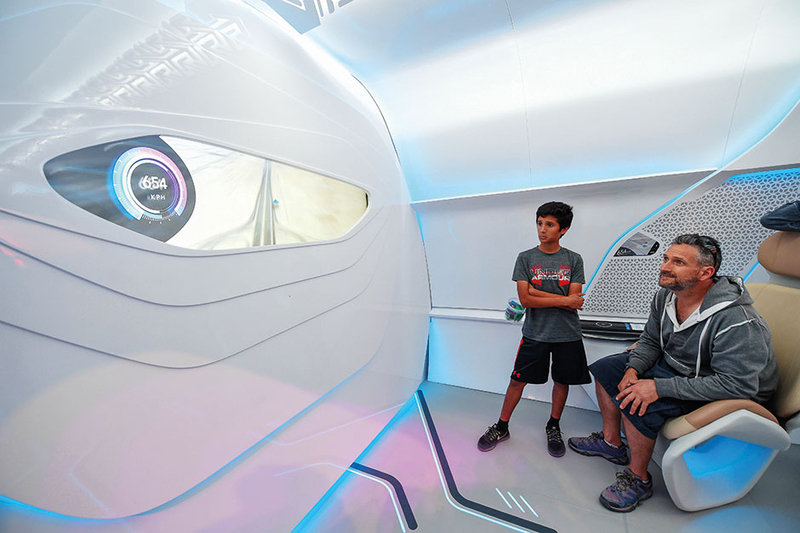 The Hyperloop pod display is being held in collaboration with Virgin Hyperloop One, whose chairman Richard Branson has invested heavily in the transportation start-up firm. Branson is working closely with the RTA and signed a major deal last Sunday to build a Hyperloop system between Mumbai and Pune in India. Al Tayer said earlier in a statement: “The Hyperloop is part of RTA’s initiatives for Dubai Future Accelerators; [the] RTA and Virgin Hyperloop One Company have made considerable progress in the technical, engineering and economic feasibility study of the project. Progress made also included identifying the routes for operating the Hyperloop along with its initial design model, which will be exhibited for the first time in the world. During the unveiling of the Hyperloop’s concept model, Abdul Reda Abu Al Hassan, executive director of Rail Planning and Project Development at RTA, said the project is expected to be operational within the next five years. Each Hyperloop pod will have a gold class with five passengers and a silver class with 14 passengers. He said the pod does not have windows to prevent motion sickness since it will be in an enclosed vacuum tube. He said the Hyperloop will not replace Dubai Metro, which is designed for short-distance travel with multiple stops within one network. The Hyperloop is designed for long-distance travel. The Hyperloop is still in research and development phase and the fare and other details have not been determined yet. Some members of the public expressed their excitement over the idea that travel time between Dubai and Abu Dhabi can be cut to 12 minutes through the Hyperloop. Haitham Al Souss, from Lebanon, said he would try out the Hyperloop once it’s operational in Dubai. “I have one project in Abu Dhabi and it will save me time and energy during my weekly commute. Now, it takes me hours to drive back and forth and saps my energy if I get stuck in traffic. That will all change once the Hyperloop is here,” he said. Khurram Khan, a lawyer, said he is interested in the feasibility and time frame of the project. “It’s also interesting if it will replace the train networks in other countries or if train networks can become obsolete in the future,” he said. Dubai: No other country compares to the UAE when it comes to the level of interest and excitement at a potential Hyperloop system connecting Dubai to Abu Dhabi, or Sharjah to Dubai, in a matter of minutes. That is according to Rob Lloyd, chief executive of Virgin Hyperloop One, who told Gulf News in an interview on Thursday that the engagement with his company’s announcements was unprecedented. “I can tell you this factually: Every time we do any major announcement, the largest audience around the world for our communications on Virgin Hyperloop One is in the UAE,” he said. What this means is that the awareness level here is the highest of any country in the world, Lloyd added. “We have that empirical data, so when we make an announcement on something happening, a new development in the company, or a project, or anything, the highest take up is in the UAE. We don’t buy ads, there’s just such interest here,” he said. According to the senior transportation executive, this reflects a “young population that is hopeful, and also reflects the fact that there is a true belief that this would make people’s lives better, and allow the country to continue to grow at the rate and scale that it’s growing”.